Q. In many countries including India, the reason for B-Schools (largely offering PGDM), to be independent from universities has been to break away from bureaucracy and to avoid becoming a cash cow, paying for generic departments, say history or literature. What are your views? A. I can’t say much about other institutes in India but I know about IIMs, and I think IIMs were deliberately started outside the university system because it was perceived that the latter was impeded by a lot of bureaucratic obstacles, was not very dynamic and was not as responsive. However, given that there is a proposal to give IIMs the status of ‘institutes of national importance’ means that some of the university-type structures will seep in, but by and large the IIM system that has evolved over the years is mature enough to deal with such structures without impeding the quality of work that is done. Besides, it will also give IIMs the opportunity to do a few other things, like rather than giving diplomas, it will be able to give degrees; it will be able to introduce some new programmes in allied areas. It will also give more flexibility on the academic side, which will be consistent with people’s need for degrees and formal certification. Given the degree granting status, we would not be trying to replicate a university system but some formality would definitely creep in to some of the processes. We already follow many of the processes but not in such a formal way as a university would do. To answer the second part, I would say, you look at the US - all the top B-Schools are part of the university. Some of them do enjoy a slightly different level of autonomy than some other departments. Problems come when you try to treat all departments the same, which at least the US universities don’t do because they know very well that B-Schools are potential cash cows and need to be treated with some amount of care. Q. Are B-Schools in India preparing leaders for global engagement? Do you see any significant difference in B-School graduates in IIMs and in top B-Schools in the West? A. It is true that, in the US for example, a typical class would be much more multi-cultural where many nationalities are represented and you are exposed to working in teams (especially in top B-Schools like Harvard, Wharton or Kellogg). However, from whatever I know of the curriculum in most of the US B-Schools, they are predominantly US-centric, barring a few cases from different countries being part of the learning. A counter argument could also be made that because India is not a single homogenous culture and an institute like IIM that has people from all over the country you get exposed to operating in different cultures. The sensitivity to multiple cultures, multi-religion, multi-languages is built up quite well in India. We have examples of very successful Indian managers heading multi-national companies globally and also sending Indian managers to head operations in say Latin America, Mexico and several other places. Q. Why do many Indian students opt for the first job-opportunity and do not become entrepreneurs? A. This issue has to be looked up at two levels: first is that as a general principle MBA curriculum is not very great at producing entrepreneurs. It is largely designed to have good managers within organizations. The second issue is that in India people do not have significant working experience before they come to a B-School. Even if they have, it is usually a couple of years and possibly in a software company. That experience does not lend itself necessarily to entrepreneurship or running a company on your own. Another crucial factor is that the fees for management education has gone up significantly including at IIMs – many of the students take loans to study and their first priority is to repay the loan after they graduate. My expectation is that students would take up entrepreneurship three to four years after they graduate. Q. Your views on capitalizing knowledge and whether there is resistance of faculty members? A. Unlike scientific R&D, business innovation is a bit different. One of the challenges for us in India is that we are not seen as thought leaders in management research or thinking. We have some industry people who may be seen as thought leaders and pioneers but in terms of management academia in general we are not seen as that and I think that is a challenge that we need to address. We must come up not only with new ideas but also with the rigorous empirical research that will support and corroborate our ideas. So I would imagine that one of our problems is we have historically not been doing high quality research in management and that is the reason why we have not been able to make a mark globally in thought leadership. Q. Could you be specific in terms of where you think the challenges lie for Indian management academia? A. Clearly there are areas where India has the opportunity to be a kind of a laboratory for the world. These include issues like inclusive growth, frugal innovations, coming up with new methods of getting access to economically underprivileged sections under various plans and schemes that the government has. I think this is where India not only has opportunities but there are many interesting things being done at the micro level to address them. So, the area for India to make a mark for itself is really in terms of theorizing about many of these new kinds of approaches. Unfortunately the field is left wide open for people from outside the country to come and study what is happening in India and then go tell the world and also literally claim IP (intellectual property) over things which are being developed here and build models around it. I will give you a simple example, when the outsourcing revolution began and the Indian software industry started becoming successful, the first people who wrote about this phenomenon and got it published in international journals were not people living in India. So, all the interesting theories and models got built offshore, though the phenomenon was happening right in our backyard. Q. Any initiatives, which IIM Indore has taken up? A. A key initiative is creation of special interest groups (SIG) comprising interdisciplinary teams of faculty members and doctoral students. The teams should have certain characteristics that of being relevant and important to India and there should be enough opportunities for us to take advantage of our unique location. For instance one SIG is on rejuvenating micro, small and medium enterprises in Indore, which is a major hub for MSMEs to enhance their competitiveness. Another SIG is working on comparing businesses in India and China while there’s other group conceptualizing in the area of frugal and inclusive innovations. What is the procedure to take admission in the IIM Indore just after class 12 ? Can i be able to get a good job after doing 5 year integrated management course in IIM indore? yeah ofcourse, BTW there is a 200% Placement in IIM-Indore. 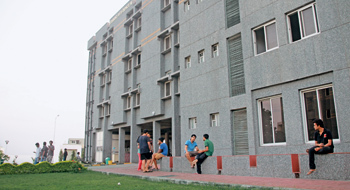 What about the integrated 5 yrs course of IIM Indore BBA+MBA?Is it worth doing? ?And what is future in it? Your IIM Indore brochure has been successfully mailed to your registered email id .